The Honda City is a compact caur which haes been producit bi the Japanese manufacturer Honda syne 1981. Oreeginally made for the Japanese, European an Australasie mercats, the subcompact City 3-door hatchback wis retired in 1994 efter the seicont generation. The nameplate wis revivit in 1996 for uise on a series o compact fower-door sedans aimit primarily at developin mercats, first mainly sauld in Asie ootside Japan but later in Laitin Americae an Australie an aw. Frae 2002 tae 2008, the City wis sauld as the Honda Fit Aria in Japan an aw. 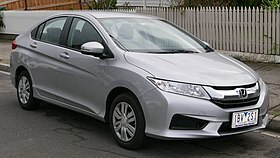 It is a compact sedan biggit on Honda's Global Smaw Car platform, which it shares wi the Fit/Jazz (a five-door hatchback), the Airwave/Pairtner (a wagon/panel van version o the Fit Aria/City), the Mobilio, an the Mobilio Spike—aw o which share the location o the fuel tank unner the front seats rather than rear seats. Bi mid-2009, cumulative sales o the City haes exceedit 1.2 million units in 45 kintras aroond the warld syne the nameplate wis revivit in 1996. In 2011, the City is sauld as the Honda Ballade in Sooth Africae an aw.